Campaigners believe people power played a role in Kettering Town being able to strike a deal to purchase an area of land in the town. The Poppies took a giant step towards a return home last weekend when it was confirmed that they had come to an agreement with Kettering Borough Council to buy the land, which is situated off Scott Road. Ever since the Poppies left Rockingham Road in 2011, their battle to return to Kettering has been met with hurdles. They spent an ill-fated 12 months at Nene Park, left vacant after the demise of arch-rivals Rushden &Diamonds. A short spell at Corby Town followed before they moved to Latimer Park, where they still play. Rockingham Road fell into ruin and, amid talk that then-owner Ben Pickering Ltd was looking to offload it, fans clubbed together to try to list it as an Asset of Community Value. given the club the opportunity to match any offers from bidders. But, despite hundreds of fans march through town to deliver a 4,000-strong petition two years ago, Kettering Council twice rejected the bid citing no evidence of the ground being in recent use and a lack of community support on the first bid. Independent councillor and Poppies fan Cllr Michael Brown called for council leader Russell Roberts to resign over the decision, discussed at several fiery council meetings. In between the first and second rejected bids from fans, the Poppies unveiled plans to re-develop Latimer Park into a 6,500-capacity stadium. But many fans still harboured dreams of returning to Kettering itself instead of being in Burton Latimer. Those dreams took a turn for the worse when Rockingham Road was bought by a developer in September 2017 and the ground was demolished in November while plans were submitted for more than 40 homes in July this year. However, ever since that march, conversations between the council and the club’s hierarchy continued, leading to last weekend’s big news. Cllr Brown was on hand to hear the news being broken to supporters at a fans’ forum ahead of the Emirates FA Cup success over AFC Mansfield. And he said: “It’s been a very long road for the Kettering community and the Kettering Town fans. “I started on this journey with my position as a councillor probably seven years ago and when Ritchie came on board, that was a real catalyst for change. 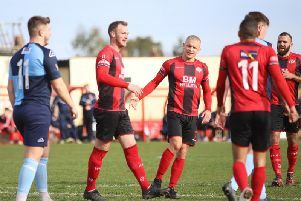 “For the first three or four years we were banging our heads against a brick wall but with the backing of the Kettering Town (Poppies) Supporters Trust and fans like Richard Atkinson and Martin Jeffs, we really pulled together a coalition. “That march was the single biggest day in the council’s history in the last 20 years when comes to sport in the borough. “That day, attitudes changed. When you have literally hundreds of people banging a drum through Kettering town centre, heading up to your office to tell you what they think, you have no choice but to listen. “The wind was behind us and once we got everyone in a room and talking, it was really a case of then letting the businessmen talk business and letting the councillors talk council business. “This is the result of that. Atkinson was one of the organisers of the march, which started at the old ground in Rockingham Road and finished at the council offices. There was understandable delight from fans as they were given some real hope of finally seeing their club return to the town after it left seven years ago. And Atkinson believes the supporters played their role in helping to make it happen. “It’s absolutely fantastic. It’s what we wanted – to go home to Kettering – and we have got that chance now,” the Poppies fan said. “There is a long way to go. The club own that site, which is the most important thing. It’s in the club’s hands. “There are all sorts of things to do and we know it will take a long time and a lot of effort. “The march was about Rockingham Road because that was the issue on the table at the time. “But what it was really about for me was about the council and the club talking to each other and finding a solution. “That’s what they have done for the last two years and they have made it happen for us all. “Getting people to get out there and do something is a different kettle of fish and all I said was that we should go and say what we had to say to the council publicly. “If we hadn’t had that march, I am not sure we would be here. I think hundreds of fans turning around that corner really made sure that the council had no choice.